Be thankful. Eat good food! Everyone has their favorite Thanksgiving dish that they just can’t live without. For some it’s the Green Bean Casserole, and for others it’s the Cranberry Sauce shaped like a can—yum! Whatever your favorite dish might be, the one sure sign you’ve made a fan favorite is an empty dish. Our Karsh Hagan family had our annual Thanksgiving Pocluck dinner yesterday. While everyone made tantalizingly tasty dishes, a few were reduced to crumbs in minutes. 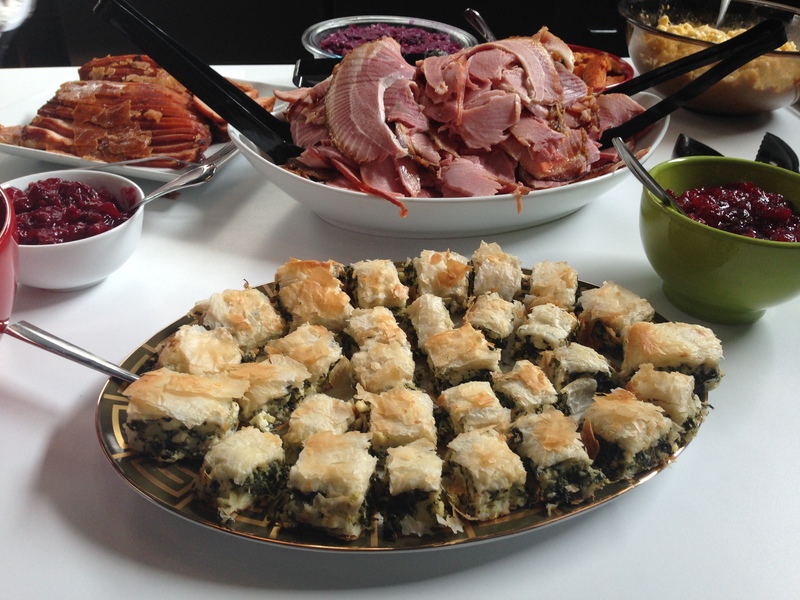 What better way to spread the holiday cheer than to share a fan-favorite recipe with you? Do this 6-7 times until you don’t have any exposed pan, pour the spinach mixture into the pan. Fold over the extra filo (as a group, not one by one) that was hanging off the sides. Butter after each fold. Butter the sides of the filo as well (in between the filo and sides of pan) so that it starts to turn into a big pocket. Layer more filo on top. At this point a lot of the filling should be covered by the extra filo. Cover the exposed filling. The width of one sheet should pretty much cover the exposed filling, but the length will be too long. So position the sheet to cover the filling (with the remaining sheet hanging off the side. Butter the sheet that’s over the filling, then fold the extra sheet on top of itself, and butter it. Repeat, switching sides, for another 6, 7, maybe 8 times. At the end, you just want to have a nice, big, secure, buttery spinach pocket. Bake in preheated oven at 375 for about 30 minutes. I start checking at 20 minutes. The top should be golden. If it starts to get too brown, cover with foil and continue baking. Let sit for about an hour, if possible, before cutting.